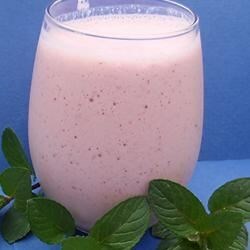 "Lassi is a refreshing cool drink also used as a light dessert during summer." Cut 3 strawberries into small pieces and set aside. In a blender, place the remaining strawberries and sugar; blend on high speed for 30 seconds. Pour in the milk and blend another 30 seconds. Add the yogurt and blend on high speed for 1 minute. To serve, place 1 ice cube in each of 3 glasses and pour in the lassi. Top with the strawberry pieces and serve. It really needs cardamom to be authentic, in my opinion. I add a pinch of ground and it's much more to my taste.